O Mother, what shall I do? Four pieces- O Mother, what shall I do? ; Ettrick Banks; She rose and let me in; Polwart on the green - all set by the 18th century Scottish musician James Oswald. This work was published in Edinburgh around 1739. 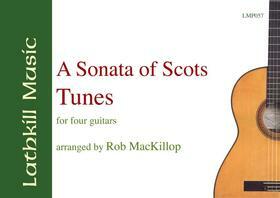 Originally scored for two violins and continuo, Rob MacKillop, one of Scotland's leading guitar and lute performers, has successfully arranged this work for four (or more) guitars by adding an extra 'viola' (guitar 3) part, which completes the harmonies suggested by the continuo bass. The first performance of this work took place at the Dundee Guitar Festival, Scotland 2000 with four guitarists to each part.